Watch Marvel's Agents of SHIELD: Slingshot in Full! Watch Marvel’s Agents of SHIELD: Slingshot in Full! You can now watch Marvel’s Agents of SHIELD: Slingshot in full using the players below! The six-part digital series, produced by Marvel Television and ABC Studios, features the character of Elena “Yo-Yo” Rodriguez (Natalia Cordova-Buckley), an Inhuman with the ability to move with super-speed, as she struggles to balance the restrictions of the recently instituted Sokovia Accords, the worldwide agreement that regulates and tracks those with super powers, with a personal mission she’s desperate to fulfill. The mission will test her abilities, her allegiances, and will feature some tense encounters with the most popular S.H.I.E.L.D. team members including series stars Clark Gregg (Agent Phil Coulson), Chloe Bennet (Agent Daisy Johnson), Ming-Na Wen (Agent Melinda May), Iain De Caestecker (Agent Leo Fitz), Elizabeth Henstridge (Agent Jemma Simmons), Henry Simmons (Agent Alphonso “Mack” Mackenzie), and Jason O’Mara (Jeffrey Mace). 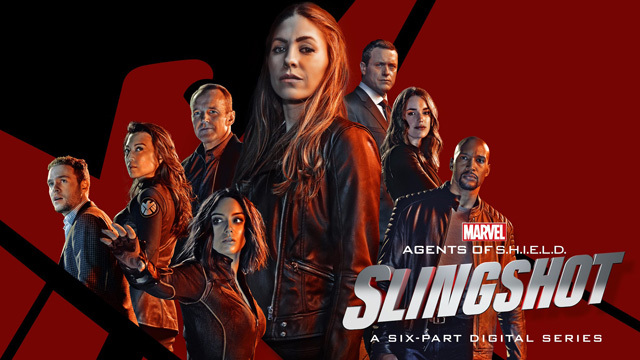 Marvel’s Agents of SHIELD: Slingshot is executive produced by Jed Whedon, Maurissa Tancharoen, Jeffrey Bell, Jeph Loeb and Geoffrey Colo. Legendary comic writer and Marvel’s chief creative officer, Joe Quesada, makes his directorial debut behind the camera with the first episode of the six-part series. Marvel’s Agents of SHIELD returns Tuesday, January 10, 2017, at 10:00 p.m. EST/9:00 p.m. CST on the ABC Network.